I knew that the full moon has been given names at various times, and I’ve photographed some of them in the last several years. 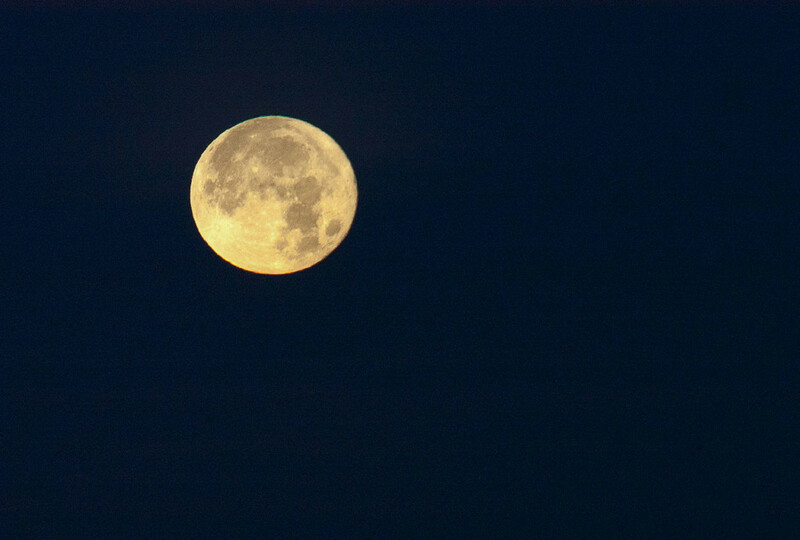 I didn’t know that there was a name for each month’s full moon until just a couple of weeks ago when I saw a poster advertize somewhere or another. I didn’t pay it any attention until I saw the press about the wolf moon of January. 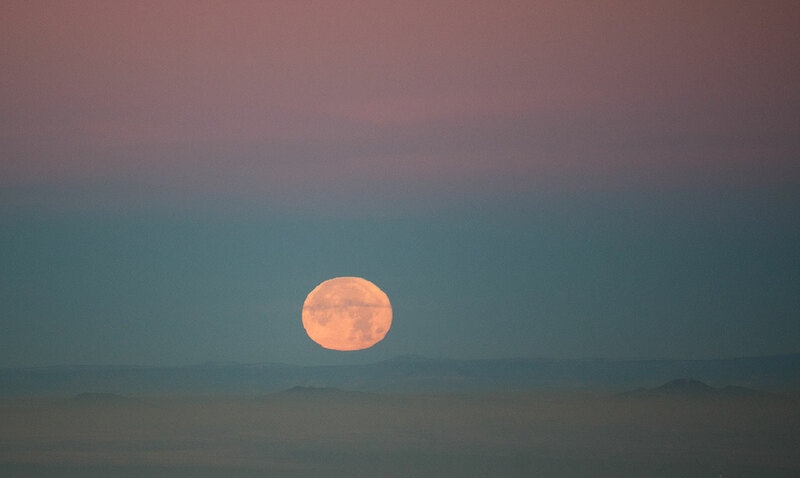 Saturday night I watched the moon rise and heard the coyotes howling and then wondered if I would wake early enough to see it set. Although I did see it very early Sunday morning I decided that it was too early for me to be out on the cold porch to get photos. I knew that if I waited a day I would have more ambient light on Monday. I set up the night before so that I would not have stumble around in the darkness looking for tripods and lenses and the like. And as the moon rise / moon set tables predicted, there it was, right on schedule. 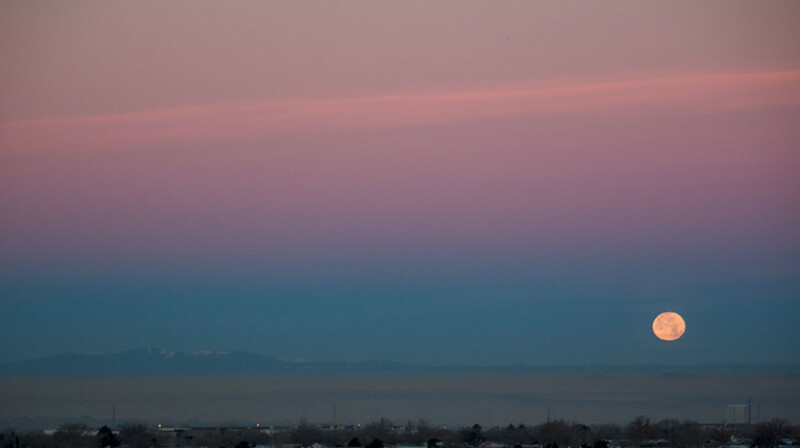 The first image was shot at 6:53 am, and the final one just 21 minutes later. One has to be ready to shoot sunsets and moon sets at this latitude. As the moon dropped lower and lower on the horizon, I worried that a band of cloud might obscure the final moments, but fortunately they thinned out in short order. For the first set of images I had my largest lens attached to a camera mounted on a tripod, but as the ambient light increased, I brought out the second camera, and rested it on top of the tripod mounted camera for a stable shooting platform. Without the zoom, the moon appears small on the distant horizon. 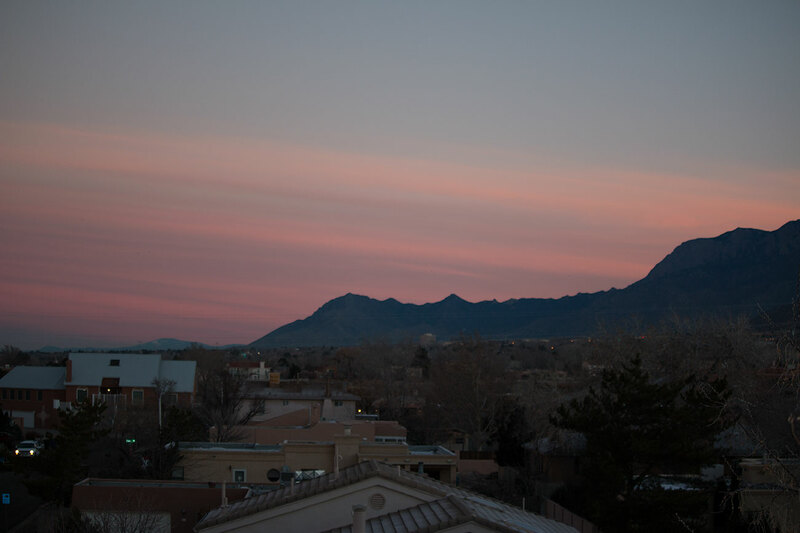 To the north, the Sandias are outlined by the first light of dawn. Meanwhile, to the west, the moon begins to distort in the light on the horizon, still partially obscured by a thin band of cloud. 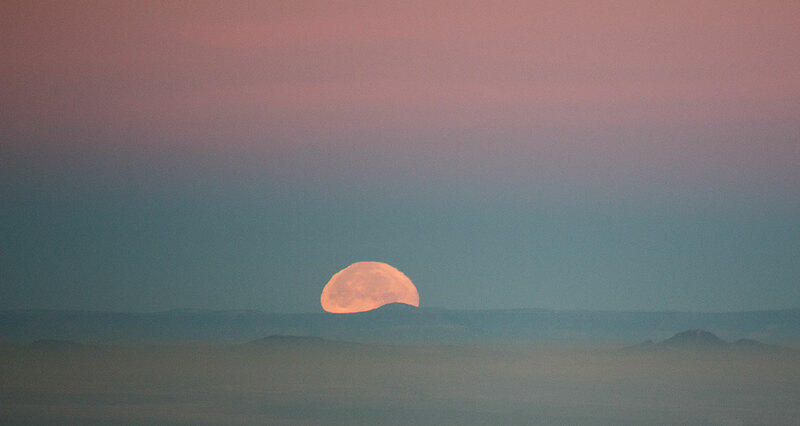 This final image is my favorite, as the wolf moon sets behind the Albuquerque volcano field. 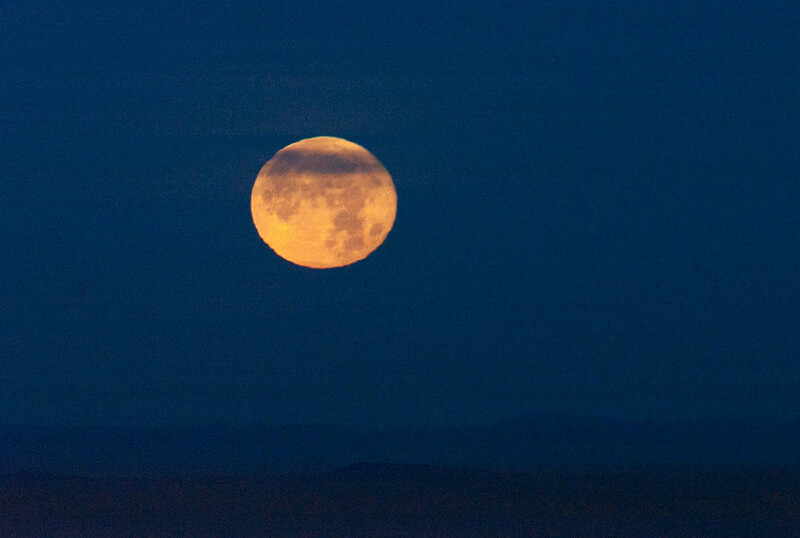 Next month’s full moon is the snow moon – perhaps I’ll try to get to see it from some place where there is a lot of snow. 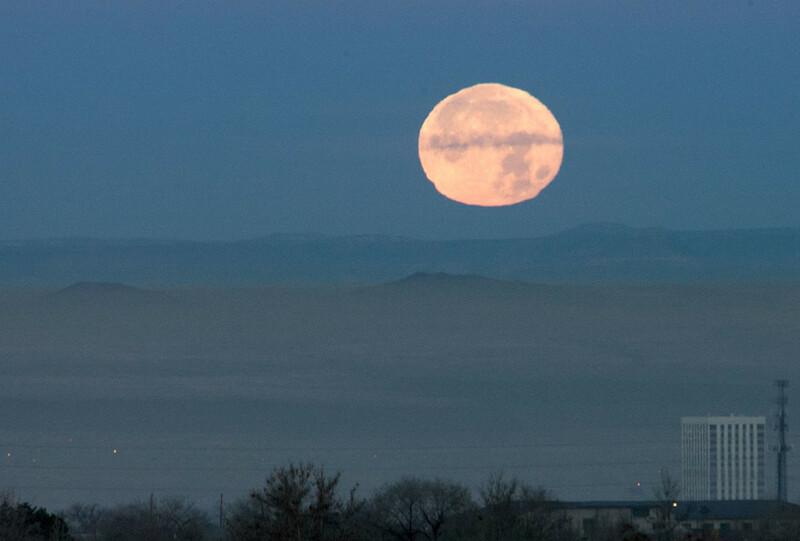 This entry was posted in Albuquerque and Environs, Landscapes of New Mexico, New Mexico Sky and tagged Wolf moon images, Wolf Moon in New Mexico, Wolf moonset New Mexico. Bookmark the permalink.